Soon after that editorial, it was discovered the Gazette's parent company, Bliss Communications, was a dark store suitor themselves and won a settlement against Janesville. In a recent article from Bloomberg, the mouthpiece for the state's largest political business lobby, Wisconsin Manufacturers and Commerce (WMC), said the dark store property tax shift does not exist. That it's based on a false premise because only $3.1 million was refunded in 2017 — a tiny chunk of the $10 billion in local property taxes paid. “We successfully opposed it last time and we will continue along those lines, telling legislators the underlying premise of the legislation is false—there has been no tax shift,” said Corydon Fish, director of tax, transportation and legal affairs for Wisconsin Manufacturers and Commerce. He also disputed the narrative that assessors are refunding vast sums to retailers through property tax litigation. A recent analysis by the Wisconsin Policy Forum, a tax policy think tank, found only $3.1 million was refunded to commercial property owners in dark store challenges in 2017—a tiny chunk of the $10 billion in local property taxes paid. “The tax shift doesn’t pan out in the actual data,” Fish said. Oh? But it does pan out for several communities in Wisconsin. 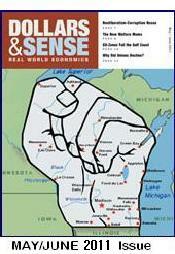 Especially Janesville. In 2017, Janesville paid out $849,637 in dark store refunds to a handful of self-described "community stakeholders." As it turns out, Janesville's population of about 65,000 in a state of 5.8 million paid $850K of the $3.1M in Wisconsin dark store refunds for 2017. So digging just a little deeper, we find one community with a little more than one percent of the state's population paid 27% of dark store refunds in 2017. Dark Store refunds are not spread or absorbed across state taxpayers as the intellectually dishonest WMC would have us believe. 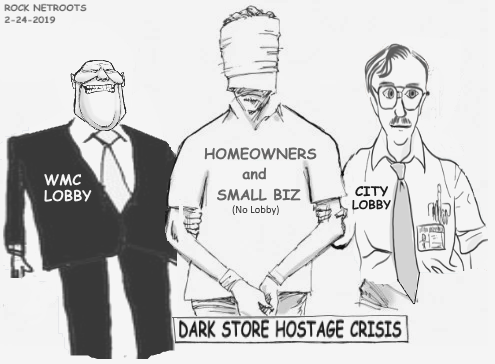 And, even if it was absorbed statewide, it would not change the fact that a significant tax burden is being shifted by the dark store loophole. The bigger problem is; intellectual dishonesty lobbies are winning. The Janesville Gazette posted one of their more comical yet transparent editorials on local newsmakers for 2018. Their take on Paul Ryan's "retirement" in my view can only be accurately summarized best with this cartoon. After Scott Walker's defeat on Tuesday, more political watchers are taking note of the sudden early demise of Wisconsin's three republican rock stars, Paul Ryan, Scott Walker and Reince Priebus. Afterall, few states in the union could boast the deep party bench Wisconsin republicans enjoyed over the past ten years. Each with 20+ years of campaign experience and cruising into middle-age with astounding records of beating the odds, they not only seemed unstoppable but destined to become the holy trinity of the future Grand Old Party. With Ryan becoming House Speaker in 2015, Politico dubbed them, "the Big Three GOP" and few would argue the trio from Wisconsin seemed well on their way to a political dynasty. But then came Donald Trump and in less time you can say "rumplestiltskin," all three have been vanquished. Rejected. Quit. Fired. Kaput. Now, I would like to instead believe Wisconsin voters woke and finally rejected Scott Walker, Paul Ryan and Reince Preibus for their scorched-earth strategies and wrong-headed policies. Honest I would. But I can't stretch it that far knowing Paul Ryan won ten consecutive campaigns and Wisconsin gave Walker a hard fought recall to think we all suddenly woke up about policy and decided to flush it down the toilet. Over the years, I've learned politics are more personal and partisan and less policy. To me, that explains why voters repeatedly elect politicians against their own wishes on the issues, and why voters are quick to backlash against a politician's personal ambitions than on their policy. Yet, voters tend to forgive politicians who make mistakes so long as the effort was honest and their intentions meant well. But Walker, Ryan and Priebus all falling within a two year period? Well, the coincidence with Donald Trump is just too striking to ignore. 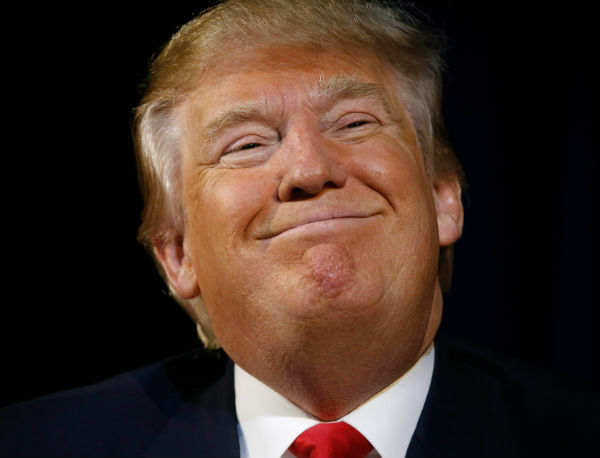 Donald Trump is by far the most polarizing hot potato I've ever seen in politics. You hold him a second too long and you'll get burned. But the shortest best way I can elaborate my view on why I think Trump is directly responsible for their demise is best done by considering how different the political landscape would be if Hillary Clinton won. If Clinton had won the presidency, Ryan would still be on his glide path to the presidency in 2020. He would have remained as Speaker doing exactly what he always does - using Democrats and Hillary Clinton as the perfect foil for roiling up the GOP base to support everything his fiscal conservatism stands for. But with GOP majorities and Trump, Ryan had run out of excuses for why his conservatism isn't a fraud and his policies junk. The same with Walker and a Hillary presidency. Walker would probably not have made the bungling decision to take on Foxconn for the same reason Walker refused to take any risk during the Obama years. Like Ryan, Walker lost the foil advantage of blaming everything wrong in Wisconsin on a Democrat and avoided making any big decisions that a Democrat could possibly take credit for. With a Hillary presidency, Priebus obviously would not have been appointed chief of staff. But like Walker and Ryan, he would have also had the foil advantage and probably run for the US Senate against Baldwin. But after his firing by Trump, Priebus found himself in political limbo much like Leah Vukmir discovered last Tuesday. Sure, I'd prefer to give credit to Hillary Clinton for their demise for losing to Trump, but that would be facetious on my part. Of course you might not agree with my perspective on this. But I leave that with a question; What do you think Walker, Ryan and Priebus would be doing today if Hillary Clinton won the presidency? Leah Vukmir Supports Local Control? She Wrote The Bills Taking It Away. I also recall at the time some state republicans claiming that the people should not have the power to create laws they benefit from. Right. Beneficial laws are reserved only for corporations. Last March, city officials announced that fire fighters would no longer use the fire station garage for private vehicle use, claiming that no other city employee was afforded that same ability. When the JFFA rightly pointed out that several city employees including the City Manager and deputy city manager continued to park at city facilities, the city retaliated with the unprecedented move of proposing to increase only fire fighters health care costs. There it is. Outside of the offensive retaliatory strike orchestrated by the city manager on the fire fighters for daring to question him, it should be noted that prior to Act 10, Local 580 agreed to make changes to their insurance including their rates to create parity among all city employees. After Act 10, that decision has kept all employees on par with the same offerings. But much like what happened to Wisconsin school teachers, Janesville fire fighters within the union are the only ones being targeted now with higher insurance costs. Once beyond those arguments, it should also be noted that when the city was facing a projected $850K budget deficit for 2017, City Manager Freitag was quick to point blame at unions for the city's budget shortfall. In an unrelated incident with an elected city council member, Freitag ordered staffers to ignore the council member's request for information because he didn't believe the council member was being cooperative. So there is a pattern of emotionally leveraged decision making. The city council as a whole however isn't exactly innocent as they continued to prop up the administration with rave reviews and raises. No surprise there. 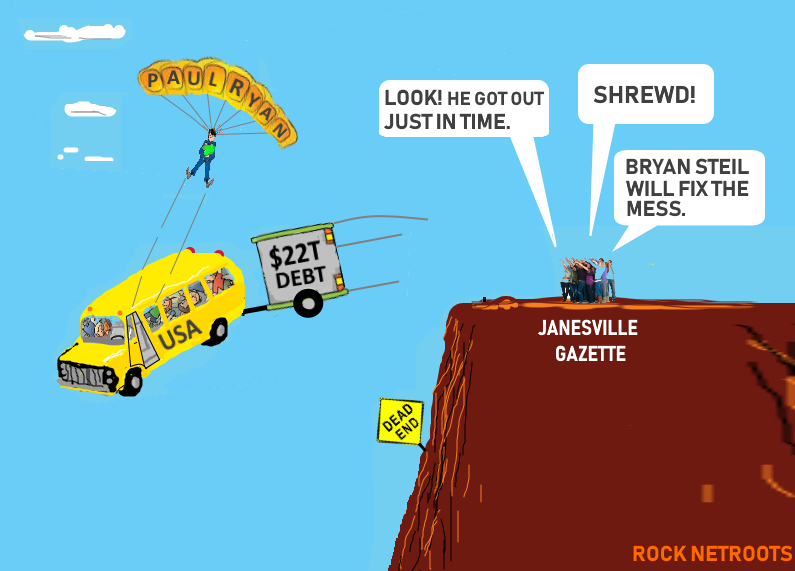 Fire fighters shouldn't expect much help on this from the Janesville Gazette either. The newspaper will help them spread the message for readership, afterall, it is news. But you might recall the Gazette is on record saying Scott Walker didn't do enough in his first term and that he should finish the job by extending Act 10 to fire fighters and local police departments as well. And, if the city's heavy-handed actions appear divisive to the average observer, the Gazette thought Walker's scorched earth approach on teachers was just about the right touch needed to make them buckle. So we can eventually expect a whitewash from the Gazette on this as well. Unfortunately, as history tells me where political loyalties are in the city's scandals over the last ten years, history also tells me this entire episode will be washed away. Because, instead of Janesville becoming the epicenter of a reconstituted progressivism fighting for good government, fairness and equality in Wisconsin during the Scott Walker error, the city willingly raced to devolve into a resentment-driven laboratory for right-wing engineered trickle-down economics. In my view, the aggressive response to the fire fighters is a deep problem in leadership that must not be allowed to go away with a statement from the city that someone misspoke or a new council rule that all employees including the city manager can no longer use city facilities for private use. Those willing to abuse power by retaliating with an iron fist against their peers over elementary equality and fairness issues don't suddenly self-medicate into Gandhi when verbally corrected. If city staffers are so easily triggered against their peers over petty squabbles, just think what they have planned for the irate taxpayer or opinionated speaker they see as their adversary. The city's emotionally charged authoritarian offensive against the fire fighters flows out from a toxic mindset and demoralizing culture that should have no refuge in our local government. Janesville residents must not let the two parties negotiate an internal "settlement" on this matter leaving bad apples on the top to continue rotting the rest of the crate and ...don't let them pretend like this never happened. Like we have repeatedly done in the past. Two Properties In Janesville TIF District Receive Revitalization Orders From The City. City Demands Owners Pay. A recent story from the Janesville Gazette (pay site - no link) states that the city of Janesville issued raze-or-repair orders for the long vacant Monterey Hotel and another building at 13 N. Main St. The properties, both inside the city's expanded downtown TIF District, appear to be early targets for revitalization. Much like the former GM Plant on the city's south side, the first major step to revitalize those properties appears to be limited to either raze or repair. But the key difference between the GM Plant and the downtown properties is downtown Janesville is in a TIF District while GM is not. What that means is city officials have determined that the entire downtown is blighted and slated for renewal and the TIF District designation was created to facilitate redevelopment projects. Unfortunately, according to the newspaper report, it appears the city is planning to bill the property owners if the city initiates revitalization by force, despite having TIF surplus funds set aside for this purpose. Several immediate questions come to mind. Were these raze or repair orders issued with malice or prejudice? What is the intent of a TIF district and what are TIF surplus funds used for? Why are some outside developers given land for free with forgivable loans while longtime property taxpayers are seemingly punished? If the city believes tearing down buildings including the iconic Monterey Hotel is an improvement (they obviously do, otherwise, why give the order? ), and part of downtown revitalization efforts, and writes orders for raze or repair of those buildings that reside in a TIF District, the city should be obligated to commit TIF district surplus funds to those properties to facilitate those improvements - for the owner - and leave the decision to raze or repair to the owner. In these cases, the funds should be there for the property owners just for the asking, especially more so if those properties are significant (they are) enough to the point that the city has singled them out (they did). And the beauty about those TIF funds, according to some wealthy developers - it cost local taxpayers nothing. Janesville Republican Lobbied For Teacher Walker And Friends Labeled as "Unsafe"
According to a report in the Journal Sentinel, one of the teachers Scott Walker dragged out into the public debate to hurt challenger Tony Evers had a state legislator lobby on her behalf. The teacher, accused of sending lewd snapchats to a student, never was charged with wrongdoing after the school agency found no probable cause she had violated the "immoral conduct" clause in state law. But that doesn't stop political party hacks from being political party hacks. "This is a damning indictment of Tony Evers’ leadership and yet another stark example of his failure to keep kids safe in our schools," said Alec Zimmerman, spokesman for the state Republican Party. The problem with that of course is; Evers had no choice but to reinstate the teacher's license. But he did not put the teacher back in a school. That would be Rep. Amy Loudenbeck of Janesville who fought for that, IF you want to indict for the failure of keeping kids safe. What's more, a staffer for a Republican state lawmaker, Rep. Amy Loudenbeck of Clinton, lobbied Evers' staff in 2015 to hurry up the investigation so the former Beloit teacher could accept a new job. After the case was closed, she taught at a Janesville school for a year. They say there's always more to a story.